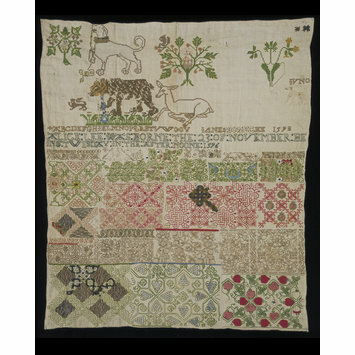 This is the earliest dated British sampler to have survived, and its inscription commemorates the birth of a child, Alice Lee, two years earlier. Its maker, Jane Bostocke, who is known to have been a cousin of Alice's and was buried in the village where she lived, may have lived in the Lee family household. The motifs at the top of the sampler relate to their family crests. 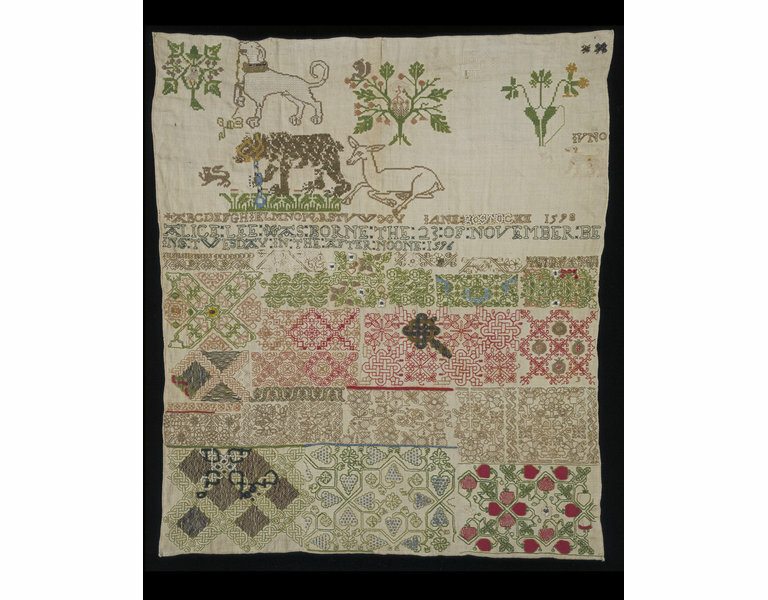 The sampler is from a period of transition in the practical use of such items - between the 16th century and earlier, when they served as a reference piece for a more or less experienced embroiderer, and what gradually became their nature in the 17th century: a method of measuring and recording the maker's skill. The embroidery is worked in cross stitch and back stitch but there are examples of work in more complicated stitches showing that the back stitch was intended to be a grounding for further elaboration. Other stitches include satin, chain, ladder, buttonhole and detached buttonhole filling, couching in patterns, coral, speckling, two-side Italian cross, bullion and French knots and beadwork. Linen sampler embroidered with silk and metal thread with pearls and beads. In the area above the inscription are the following motifs: an owl in a tree, a dog with collar and lead, a lion passant guardant, a chained and muzzled bear in a field of daisies, a tree with a squirrel and a pelican in her piety, a crouching hind, a spray of cowslips and a small dog with 'IVNO' above it. There are also three small motifs that have been unpicked, which appear to be a castle on an elephant, a squirrel cracking a nut, and a raven. All of these motifs are worked in cross stitch except for the large dog which is filled in with closely worked arrowhead stitch. There are also two tiny examples of metal thread interlacing in the top right corner. 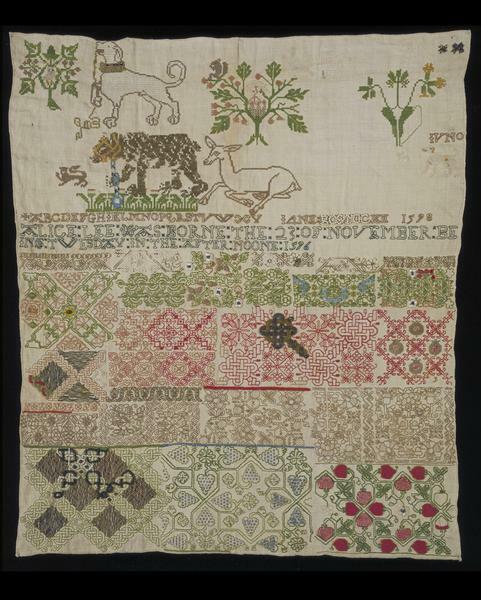 The rest of the sampler is filled with formal geometrical and floral repeating patterns. These are worked mainly in back stitch, but there are examples of work in more complicated stitches showing that the back stitch was intended to be a grounding for further elaboration. Other stitches include satin, chain, ladder, buttonhole and detached buttonhole filling, couching in patterns, coral, speckling, two-side Italian cross, bullion and French knots and beadwork. The colours are brown, greens, red, pink, blue, white and yellow. The lettering of the inscription is worked in back stitch with Algerian eye stitch punctuation except for the letters 'BOSTOC' which are worked in seed pearls over a back stitch foundation. According to research published by Martyn Freeth (see bibliography), Alice Lee and Jane Bostocke were first cousins, both grandchildren of Thomas Lee (1500-62) of Langley and Jane Corbet of Moreton Corbet in Shropshire. The 3 motifs which have been unpicked are crests or badges from Jane's side of the family, while those still in place are from Alice's. Sampler of embroidered linen with coloured silk and metal threads, seed pearls and beads, made by Jane Bostocke, England, dated 1598.